Maybe this belongs more in a travel board, but I'll put it here in weather. I'm supposed to be driving from Jacksonville back home to upstate NY on Saturday. Our intended travels plans bring us through the Carolinas and possibly Virginia toward the end of this potential snow event. I wouldn't worry much traveling after a few inches of snow in the northeast, but I have no experience with winter travel in the south. Say 4 or 6 inches of snow falls on I-95 in NC on Friday night into Saturday morning. So I'm looking for experience from on the ground from those who have lived similar situations in that area. Would we be likely to have serious trouble on Saturday afternoon, a couple hours after it ends? Driving anywhere south of DC during a snow event is apocalyptic. They're unprepared and aren't as adept as northern states when it comes to dealing with the snow. Throw inexperienced drivers into the mix and it's a recipe for disaster. The saving grace is that I-95 avoids most urban areas in NC (except for Fayetteville). Still, if the situation that you describe actually comes to be, be prepared for some major, onerous delays. They simply don't have the equipment and the material to deal with storms down there. Virginia isn't too bad, especially the further north you go, (and technically you don't have to deal with DC), but it's not going to be fun in the Carolinas. Your biggest piece of fortunate luck...it's not a weekday, so you won't have commuting traffic on the road. I'm beginning to doubt driver inexperience as a factor peculiar to mild climates. Up here in New York, it seems like every season people forget how to drive all over again; particularly Downstate, it doesn't seem like anyone's driving behavior changes because of winter weather. I think people count on their experience as northerners to save them innately, rather than actually adjusting to the driving conditions, and it's only the more prepared and better-equipped transportation agencies that keep incident rates low. I'm thinking western and central NC and the I-81 corridor be more likely to be able to handle it than I-95. Accurate or just wishful thinking? Western NC and the mountains of Virginia (I-81) shouldn't provide too many issues. They're used to dealing with the snow. They're actually expecting more snow in central NC than we are in eastern and southeastern Kentucky. I worry more about other drivers than I do myself. I've told this story before -- I was returning from Washington, DC in January 2004 and was planning to use the I-66 to I-81 to I-64 route, having driven the I-79 to I-68 to I-70 to I-270 route to get to DC. It started snowing shortly after I fueled up at the Haymarket Sheetz and by the time I got to I-81, the road was starting to get covered, yet the trucks were still flying by me as if the road was dry. I had no desire to battle them all the way from Strasburg to Lexington, so I bailed at VA 55 (which had, at the time, been newly-signed in Virginia as US 48.) I drove VA/WV 55 to US 220 to VA 42 to VA 93 to US 219, and felt safer driving in several inches of snow on the two-lane mountainous West Virginia routes than I would have on I-81 with trucks paying no attention to weather conditions. Not sure about SC or VA, but in NC the problem is lack of equipment. We just don't have a ton of snow plows in the eastern part of the state. That said, what plows there are will have concentrated on the primary routes like the interstates and major US highways first. I-95 shouldn't be too much trouble, just avoid getting off of it for fuel/food because I have zero idea what the side roads will be like. Looking at forecasts for this upcoming event anything south of I-40 should be decent, north of I-40 could be iffy with as much as 6-8 inches of snow in the forecast. That, coupled with up to a half inch of ice accretion before the snow and our use of liquid brine solution should make for "fun" times. That bottom picture HAS to be from Atlanta, lol. Actually (and I say this every year at work) we have more wrecks in my town on a sunny day in the summer than during any winter event. Why you ask? Because the town goes into full-on-the-end-is-near panic mode and shuts down tighter than a drum. Everything closes. I fully expect to be one of the very few that will have to be out in this crap trying to get to work in the morning. 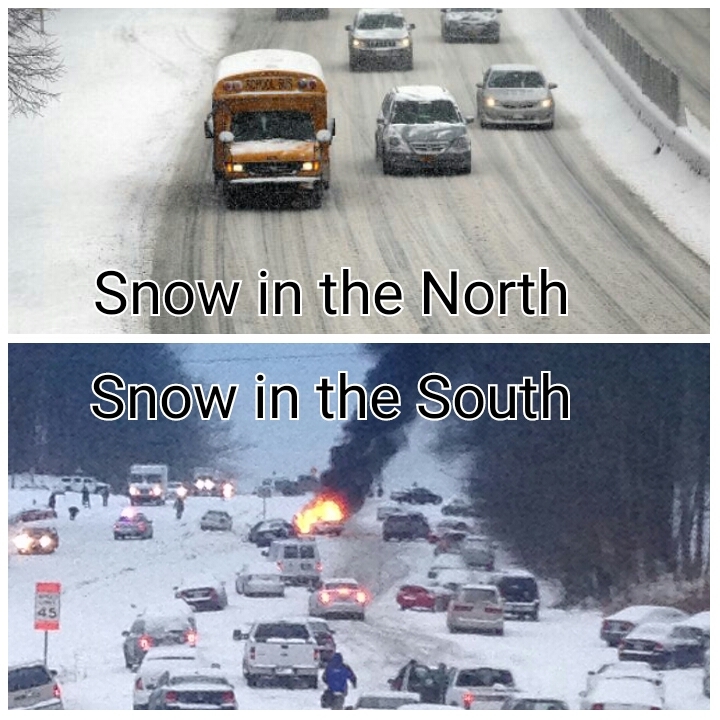 The bottom picture was taken in Raleigh NC. Photoshopping it into all sorts of jokes was quite the meme. So the car really was on fire? I figured that was part of the 'Shop job. I stand corrected. Wow, I knew Raleigh was full of morons, but I never thought it was that bad, though. I worked that day down here in New Bern, and a quick check of my system confirms I was remembering correctly, it was one of the slowest days of the year for call volume for us. That year we had 3 snow storms back to back (something that never happens here). I got my 2014 Mustang between the first and second storm and I remember being pissed that my brand new car was going to be exposed to salt and it didn't even have 100 miles on it, yet. Looking at the current situation from here in Jacksonville this morning, I am thinking my best bet will be I-95 I-26 I-77 I-81. It's more west so the actual snowfall should be over by the time we get to the affected areas, and hopefully we'll be able to get north of the worst of the effects along I-81 before too late this evening. For anyone wondering, my post-storm Saturday route up I-77 and I-81 worked well. I came through a few hours after the last of the snow and sleet fell in the area and the sun was out. The interstates were mostly dry with the occasional wet spot that had the potential to freeze up later. Even in the areas that easily had 6-8"+ of fresh snow, I-77 was cleaned up nicely. Between Charlotte and Statesville, I saw a good number of abandoned cars on the shoulders or further off the road, including one that looked to have crashed into a sign, so it was apparently a lot worse earlier. The only small delay we had was a closure of I-77 for an exit because of an earlier accident near Union Grove. Most traffic was using NC 901 to US 21 to US 421, and Google showed lots of traffic trouble along that detour. We decided that our northerner driving experience and an all wheel drive SUV with good snow tires was up for a much shorter detour on county roads between NC 901 and US 421 on the west side of I-77. Even most of those were in reasonably good shape, with the exception of a couple miles that had not been plowed. Nothing that caused us any concern or trouble. The only real slippery travel didn't come until the early morning hours today when we ran into a persistent squall over the Thruway between Schenectady and Amsterdam. I think in the end, this choice of route probably worked a lot better than trying to fight our way up I-95, where the weather lingered much later into the day yesterday. The ride took pretty close to the same amount of time as it normally takes us.